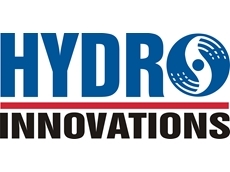 Hydro Innovations are the exclusive distributors of Gorman Rupp pumps in Australia. Areas of speciality include self priming pumps for industrial wastewater, sewage, grey water and fuel. They also include self priming and auto prime units for mine and construction site dewatering, and rotary gear pumps. By using an EDUR Multiphase pump, the compressor, air saturation vessel, the standard pump, and the control system can all be eliminated, along with the on-going maintenance that goes with them. The EDUR Multiphase pump is capable of handling a mixture of liquid and air, so when set up correctly, the pump draws atmospheric air into the suction line and feeds it under pressure straight into the DAF tank.After drawing air into the suction line, the EDUR pump mixes and sheers the air then imparts up to 6-7 BAR of pressure on the discharge line. This pressure “forces” the air into solution. When the air saturated liquid reaches the DAF tank (DAF system), the air comes out of solution to form 30-70 micron bubbles, which attach to floating matter and bring it to the surface.Simple, with greatly reduced maintenance needs. 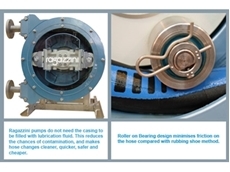 The Ragazzini Rotho MS0 is a positive displacement peristaltic [hose] pump with a “roller on bearings” design so that the pump housing does not need to be filled with lubrication fluid. The pump is self priming, seal-less, can run dry without damage, and apart from the flanges, only one part comes in contact with the pumped fluid.The MS0 is self priming and widely used in water and waste water treatment, the food and beverage industry, chemical industry as well as construction, paper, ceramic, paints, inks, mining and marine industries.MS0 Rotho pumps are available with a wide variety of hose options to suit abrasive and/or corrosive applications and are also available with food grade hoses capable of being sterilized with hot water [to 70o] and/or steam [to 120o]. A leak detector is standard equipment to provide early indication of hose failure. This is a float type sensor that is located at the lowest point in the pump. 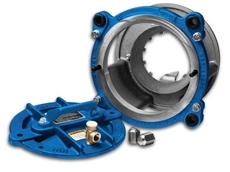 Because the pump casing is not filled with lubricating fluid and the speed of the leak detector, contamination is and product loss is greatly minimised.The MS0 is the perfect pump for clean in place [CIP] or sanitise in place [SIP] applications when fitted with the optional “retractable roller”. With this system, one of the rollers can be retracted via an over-centre rapid release cam and lever system. This now enables full flow of a flushing/cleaning/sanitising fluid through the hose. This new positioning system is essential for fully automated foodstuff handling applications that require regular cleaning and sterilisation of all the components in contact with the product.The MS0 can deliver up to 75 litres per minute [lpm] on intermittent applications or up to 20 lpm for heavy duty 24/7 operations. Pressures to 15 bar can be achieved and solid particles up to 17mm diameter can be passed through the pump. It can also be run in reverse, making it ideal for tank emptying and filling operations.Within the full Ragazzini range, flows as low as 0.2 litres per hour [lph] can be achieved as well as flows as high as 180,000 lph. Hydro Innovations are exclusive distributors of a wide range of Gorman Rupp Self Priming Pumps for sewage and wastewater applications. Ultra V Series Self Priming Pumps for solids handling Combined solids handling with high head performance and efficiency Available as single stage or 2 stage versions Fitted with solids handling impeller Patented cartridge seal for accurate and easy installation- double floating, self aligning, oil-lubricated mechanical seal Replaceable wear plate with a self-cleaning design Anti-rotation ribs that reduces internal wear and maximises seal life Patented External Shim-less adjustment system Super T Series Self Priming Pumps are easy to operate, service and maintain Fitted with solids handling impeller and Patented cartridge seal A self priming centrifugal pump recommended for wastewater applications and municipal sewage pumping Fitted with suction lifts up to 7.5m Removable cover plate Removable rotating assembly Other Self Priming Pump Products As a leader in self priming pump technology, Gorman-Rupp also offer Super U Series, 10 Series, 80 Series, 0 Series and ADD self priming pumps. 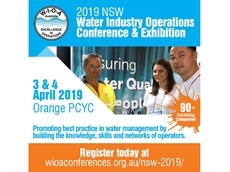 01/04/19 - Hydro Innovations is participating in the 2019 NSW Water Industry Operations Conference & Exhibition being held in Orange NSW on 3rd and 4th April 2019.The WIOA Conference & Exhibition promotes best practice in water management by building the knowledge, skills and networks of operators.Join Hydro Innovations for this special 2-day event at Stands 3 & 4 where they will be showcasing a range of products suitable for the water and wastewater industry.Hydro Innovations’ exhibits include:Gorman-Rupp self-priming wastewater pumps, including Gorman-Rupp’s latest solids handling sewage pumping technology. 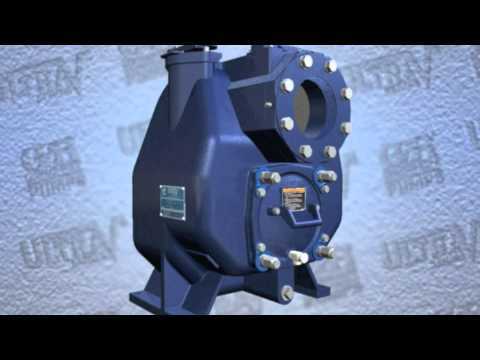 The ‘Eradicator Solids Management System’ enables pumps to handle stringy materials such as rags and wet wipes.Ragazzini peristaltic pumps for pumping a wide range of viscous products, including sludge, activated carbon, and chemicals dosing. 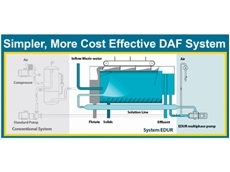 Only one part is in contact with the fluid, so the operation is simple and the maintenance is uncomplicated and fast.EDUR DAF pumps to reduce capital costs and maintenance costs associated with conventional DAF systems. 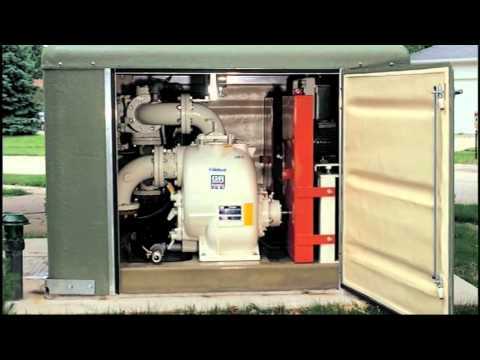 The pumps replace conventional pumps and don’t need compressors or air saturation vessels.Venturi-Aeration systems are ideal for aerating tanks, lagoons, ponds or oxidisation ditches. V-A units are mounted on the banks of lagoons or on the outside of tanks so they are easy to monitor and maintain. They are also much safer for operators who don’t need cranes or boats to access equipment.The WIOA Conference & Exhibition will be held on Wednesday 3rd and Thursday 4th April 2019 at Orange PCYC, 2-10 Seymour Street, Orange NSW.Register at www.wioaconferences.org.au/nsw-2019. 31/01/19 - A self priming wastewater pump from Gorman-Rupp is helping a leading sheep and lamb processing facility near Sydney maintain their reputation for quality.Southern Meats Pty Ltd is a hi-tech meat processing facility strategically located just south of Sydney where they have access to sheep grown in the healthy environment of NSW’s Southern Highlands region. The company not only supplies quality meat to the local market but also exports around the world, relying on high-tech automated equipment in their slaughtering, boning, chilling, freezing and rendering facilities.Seeking a reliable pump with the performance capability to deliver 50L/s plus for their wastewater treatment systems, the plant approached Gorman-Rupp for a solution.As the world leader in self-priming pump technology, particularly in wastewater pumping applications, Gorman-Rupp supplied a pump that could be mounted at ground level (and not in the wet well), ensuring safe and convenient access for their operators. Additional safety features built into the pump are designed to protect operators and the pump from damage.Self priming pumps deliver several advantages to asset owners. For instance, they don’t need to buy rated lifting chains or have the hassle of annual inspections or replacement, which would have been necessary with submersible pumps. Since wet well lids remain closed, the need for fall protection equipment such as anchorage points, body support, connectors and descent/rescue equipment is greatly reduced.Plant Engineer, Mick Speering is happy to recommend Gorman-Rupp pumps to anyone wanting a quality wastewater pump.More information on Gorman-Rupp pumps can be obtained from Hydro Innovations at info@hydroinnovations.com.au. 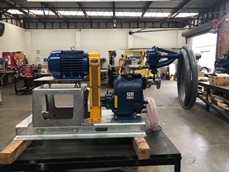 08/11/18 - A New South Wales Council recently acquired a Gorman-Rupp T3C60SC-B pump for unloading wastewater tankers. These tankers collect wastewater from septic tanks, which can contain stringy materials such as rags and wet wipes.Seeking a pump that could deal with the demands of this specific application, the Council chose Gorman-Rupp’s ‘eradicator solids management system’ as it met their needs. An enhanced and upgraded version of Gorman-Rupp’s dependable Super T Series sewage and industrial wastewater pumps range, the new Gorman-Rupp T3C60SC-B is equipped with the eradicator’s patented features to deal with these tricky materials in wastewater. Key design features include an aggressive self-cleaning wear plate incorporating integral laser-cut notches and grooves combined with a revolutionary lacerating ‘tooth’ to constantly and effectively clear the eye of the impeller; lightweight inspection cover for faster and easier access to the impeller without affecting internal clearances; and an obstruction-free flow path. 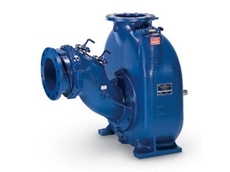 Gorman-Rupp’s Super T Series range extends from the T3 (80mm suction and discharge) to the T10 (250mm suction and discharge), which can all be upgraded with the ‘eradicator’ system. The ‘eradicator’ system is available as an upgrade kit for all Super T Series pumps in the field. Wastewater flows from 5L/s through to 200L/s can be handled by these pumps.The pump is expected to deliver years of wastewater pumping capability for the Council. 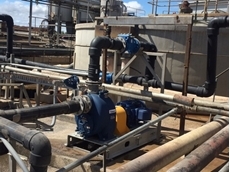 15/10/18 - A major snack manufacturer based in NSW recently installed a Gorman-Rupp self-priming pump to service one of their wastewater pits. Gorman-Rupp’s T2 pump was chosen because the flow was under 10 L/s; additionally, it can self prime to 7.3 metres and re-prime unattended, automatically every time.The manufacturer also liked the reliability that came with each Gorman-Rupp pump. 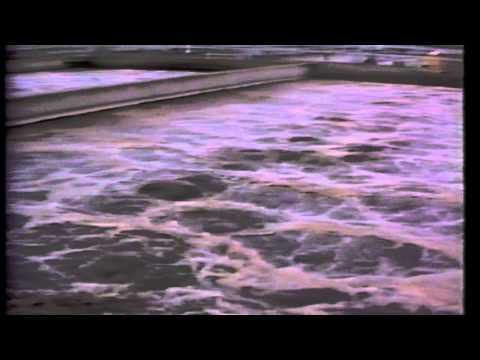 Since this particular application involved the pumping of corrosive wastewater, the pump was fitted with internal parts made from CD4MCu, a duplex stainless steel that not only resists corrosion but is also hard enough to resist abrasion from grit in the pumped media.Key features of Gorman-Rupp’s T2 self priming pumps include ability to pass a 38mm spherical solid; and large removable inspection cover allowing operators to access pump internals for inspection and/or service. Since the pump is located at ground level, there is no need to employ cranes or lifting devices, or expose operators to confined spaces during service and maintenance, ensuring their safety.Gorman-Rupp self-priming pumps are available from Hydro Innovations.